On 28 March 2015, Metropolitan Hilarion of Volokolamsk, chairman of the Moscow Patriarchate’s Department for External Church Relations, rector of Ss Cyril and Methodius Theological Institute of Postgraduate Studies, who had arrived in Kazan to take part in the celebrations marking the millennium of the demise of the Holy Prince Vladimir, celebrated the All-Night Vigil at a church of the Kazan Orthodox Theological Seminary. At the entrance to the Church of St John of Kronstadt, Metropolitan Hilarion was met by Hegumen Yevfimiy (Moiseyev), rector of the Theological school. 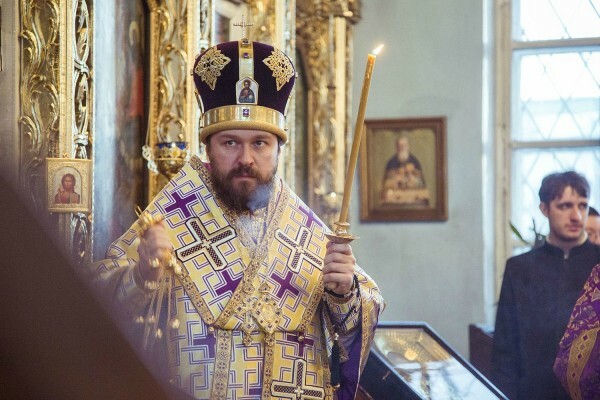 Concelebrating the All-Night Vigil with Metropolitan Hilarion were Metropolitan Anastasy of Kazan and Tatarstan, Bishop Mefody of Almetyevsk and Bugulma, Hegumen Evfimiy (Moiseyev), as well as the DECR staff members, Rev. Dimitry Safonov and deacon Alexander Karzan, and ordained members of the faculty of the Kazan Theological Seminary. After the service, Metropolitan Hilarion of Volokolamsk met with students and faculty of the seminary. In his address, the DECR chairman dwelt on educational standards of modern theological schools, as well as on the activities of the working groups compiling new course books for different disciplines. For instance, Metropolitan Hilarion told about the work of the group compiling a course book on the New Testament. To conclude the meeting, the archpastor answered questions from the students and faculty of the Kazan Theological Seminary.